Michael Nawa, longtime owner of Custom Maintenance Services, receives the 2018 WorldSweeper.com / World Sweeping Association Award of Excellence in Power Sweeping , the United States power sweeping industry's highest honor. 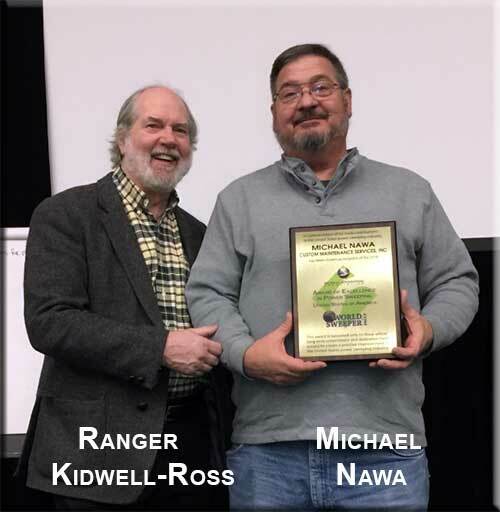 At the National Pavement Exposition, held in Cleveland in February of 2018, the WorldSweeper.com/World Sweeping Association Award of Excellence in Power Sweeping was awarded to Michael Nawa, longtime owner of Custom Maintenance Services. The following is an overview of the background of Michael Nawa and his company, Custom Maintenance Services. Note that Michael is the first two-time winner of this award. In 2004 he was a co-winner, with his father, of the pre-cursor to this award, American Sweeper Magazine's Award of Excellence in Power Sweeping . The following is the text of the announcement made of the award by Ranger Kidwell-Ross at the National Pavement Exposition Roundtable. The winner of this year's WorldSweeper.com / World Sweeping Association Award of Excellence in Power Sweeping graduated from high school in 1975. Having no desire to go to college, a year later – armed with about $5000 in capital from his father – he founded a fledgling company with the intent of providing landscaping services to his local business community. Two years later, in 1978, he purchased his first sweeper. 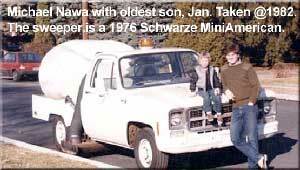 It was a used Schwarze Mini-American model. This was a round tank, two-yard, machine on 1/2 ton Chevy chassis. The Mini-American had dutch double doors in the back and did not dump except via shoveling. The sweeper was outfitted with a hand-crank winch to raise and lower the sweeping head and had no gutter broom or similar. He initially purchased the Mini-American in order to clean up grass from his landscaping operation. At the time, the sweeper was about $27,000 new; as a two-year-old machine he paid $7500 for it. However, the sweeper came with two small shopping center accounts. In the intervening four decades, he grew his business into one of the largest operations in his Pennsylvania marketing area. He credits his success with being a good salesperson, as well as from taking care of his customers very well. To quote: "You can always hire a good manager but you won't have any accounts if you can't sell and then service them." Michael Nawa also has served on the Board of Directors at the National Pavement Exposition, has been a Board Member for NAPSA and currently serves on the Board of the World Sweeping Association, where he is also Founding Member. In September of 2017 Nawa sold his company, today called Custom Maintenance, after 40 years of being in the sweeping, landscaping and exterior maintenance business. It is with great pleasure that we present the World Sweeping Association/WorldSweeper.com 2018 Award of Excellence in Power Sweeping to Michael Nawa. Click on the video shown below to view the award acceptance video. For more information about Michael Nawa, we invite you to check out the featured contractor article done on his company, Custom Maintenance Services, in September of 2012. You may also contact Michael Nawa via email sent to mnawa@comcast.net. If you have questions or comments about this article, please, let us know and we can add it in as an addendum to this article.